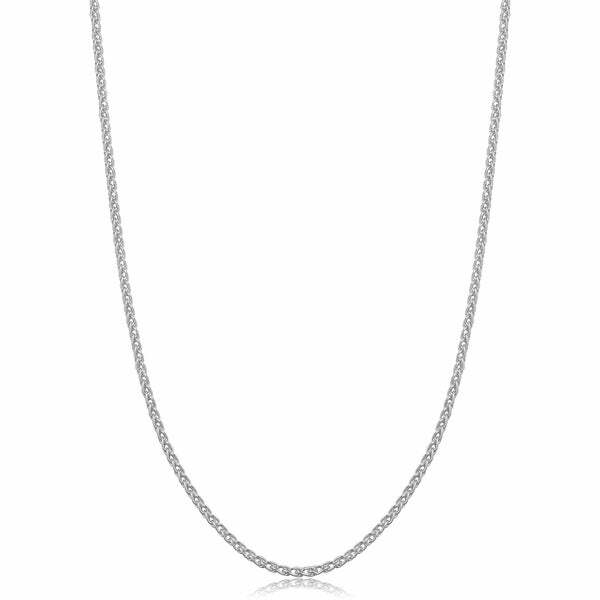 Add delicate charm to your look with this lovely chain from Fremada. The chain is crafted from sterling silver with wheat-style links that give the piece an ornamental elegance. The high polish chain is available in a variety of different lengths, and secures with a lobster claw clasp. I have trouble finding the 16 inch chains so I am very pleased that this is available. I think a 15 inch would suit better but they are non-existent. This chain is sturdy enough to hold my pendants and give me peace of mind that it won't break easily. It has a lobster claw clasp, which I consider to be a must. It is good quality and reasonably priced. It sparkles in the light but doesn't steal the attention away from the pendant that it is holding. I may order several more of these. The chain is of a nice quality; however, the color of it looks more like a bright white silver instead of the grey sterling silver as shown in the photo. So, I would not recommend this chain if you plan on using it with a pendant that is more of a gray sterling silver color. I had originally bought it for a gray colored sterling silver pendant and the Fremada Sterling Silver 1.5-mm Round Wheat Chain shows as too white to match. So they didn't look good together. I ended up keeping it for myself to use with a black tourmaline pendant which looks nice with the contrast. Fortunately, I had another chain available in the sterling silver gray color that matched the pendant that I purchased the Fremada Sterling Silver 1.5-mm Round Wheat Chain. If I didn't have the black tourmaline pendant available to use with the Fremada Sterling Silver 1.5-mm Round Wheat Chain I probably would have returned it. So, if you have a pendant that would look good with a white toned sterling silver chain this could work for you. I ordered this sterling silver wheat chain to go with a cross pendant I'd also purchased from O. ( Yes, the pendant did come with a chain, but those chains that come with a pendant are notoriously worthless; so just plan on buying a better one for your pendant.) I got a good value from O. on the pendant; so I don't mind upgrading the chain. FIVE STARS! Fremada Italian Sterling Silver 1.5mm Round Wheat Chain (14-36 Inch) I bought this chain in the 18in. size. It really is a pretty necklace. I searched online to see which type of chain is least likely to kink & get tangled & this was one that was recommended. This chain exceeded my expectations. It is the perfect size, not too thin and not too thick. I chose the 22 inch length and it is perfect for my sterling silver pendants. I have other chains but I only wear this one now. Beautiful! Don't hesitate to purchase. Their silver chains are an unbelievably good bargain. These sterling silver chains are very well made, measure exactly up to what their size is as given in the posting, and absolutely look great. I'm used to buying gold and silver chains from Tiffany, so, I guess you could say I'm extraordinaiily pleased with the value on these sterling silver chains. I would highly recommend this brand and vendor to anyone who purchases silver chains. These look great with many of the different charms I have in my jewelry box, and they also look great on their own. These are outstanding chains, at a very, very good value. I highly recommend this product. Needed a silver chain for a pendant I received from my Granddaughters as a gift. THIS was the perfect chain! I was pleasantly surprised! I bought the 30 inch wheat chain because I did not want a short one since it was one of those pendants that opens up and is not tiny. I love my wheat chain! Too bad I did not grab another one in a shorter length to give as a give to my sister, especially since she is a 'silver' girl! This is an attractive chain and I like the lobster claw clasp. Looks great with my silver pendants. Good value.. I bought this chain for an angel wing pendant I bought on Overstock for my granddaughter. The chain is high quality with a lobster claw clasp. The charm fits perfectly over the clasp and looks great. I would highly recommend this chain. Great all purpose silver chain. I ordered several of these chains in 2 different lengths. They are attractive and work beautifully with a variety of pendant styles. They are strong and I haven't had any curling or kinks. They are brightly polished giving a high quality look. I was surprised at the quality of this chain. It's prettier then I expected. Thank You. I have several pendants and I like to change the length of the chain that I wear them on, depending on what outfit I am wearing. This chain was a nice bright silver, and sturdy enough so that I do not have to worry about it breaking. It is a very attractive, solid chain. Medium in diameter that looks good with a variety of pendants. I ordered one chain in each length. They are all fine silver, sturdy yet, very pretty and lady like for those who want to wear one at a time....with a delicate pendent. I like the chains, they are beautiful, very flex able and dainty . Fine jewelry is so expensive, it was nice to find such a lovey chain in sterling silver. I would recommend them to any of you. Good buy! I purchased the 20 inch chain for a white gold sapphire pendent. The chain is very bright, sturdy and beautiful! Wish they sold a matching bracelet. For the price this necklace has not tarnished. I've had it for several months and so far it's good. Nice chain and impressed with the quality. Thanks for this item. just the size I needed and the shine it has just glitters, love it. Much thinner than I thought it would be, however very pretty. Bought this for my girlfriend and she absolutely loves it! This is just what I wanted - very nice. Mrs. likes it with her pendants. I cannot complain. "I need a sturdy chain that will hold my precious pendant, but I am curious which one to get that WILL NOT be prone to snagging my hair. I need one that I can sleep in and leave on all the time that will not tangle. Can you help? I have read reviews about this one & it sounds like what I want, but I want a professional opinion : ) Thanks very much!!" I am very sorry to tell you that I ordered this, waited two months, gave up on it, and later found that it had been sent back to the manufacturer. I don't have the whole story, but Overstock has always been dependable to me. So I have not seen it. My guess is that it is sturdy enough and you would not have to worry about twisting, but wearing it continually would mean that you will have to use some silver cleaner on it now and then. I also don't know if your pendant has an opening large enough to attach it to the chain. Sometime closures are larger than the pendants and the pendant will not be able to be put on the chain. A jeweller will be able to assist you. I am not a professional jeweler - just a woman who relates to your question, and I think this is the chain for you. The clasp is strong, the links are nice and tight so they do not snag in my hair. My chain holds a beautiful turquoise and silver pendant that my Mom gave me years ago. It has a nice weight to it - not too heavy, not too light. I love mine and highly recommend it. "Do you have a wholesale price? and where were these chains made?" "Hi. Are the chain links solid or hollow? Thanks." This chain links are solid. Keep in mind that 1.5mm isn't very thick, but it is sturdy. I'm very happy with it and you can't beat the price! I love this chain , the chain itself is solid. It's not a thick chain. But very feminine and will hold up. I think you will be very happy with it. I use different pendants on it and it holds up wonderfully. The chain is solid. Very pretty! "How wide is the clasp? I am looking for a chain with an end less than 3mm to slide through my pendant." Hello Grant, thank you for your inquiry. Unfortunately, the information you have requested is currently unavailable. You will receive an email notification once an answer is posted. Have a great day. The part of the clasp that goes through the bail is 2mm. I need a 20 inch chain and this looks nice. I needed a new silver chain. "will this chain tarnish over time? sterling silver tends to do that with my skin"
Hello alexander, this chain has an E-coat coating, so it is protected for about a year. Tarnishing can happen with time, after the first year. I hope this information helps. Thank you for shopping with us! When I was a kid "STERLING SILVER" meant it would NEVER tarnish. That's how you knew it was good jewelry. But in today's world it all tarnishes. When I was young, we used to coat silver chains with clear nail polish to prevent the chain and skin from reacting with each other. "what is the grade of silver??" Hello jokuly, this chain is a great addition to any wardrobe! This chain is made of sterling silver 925. I hope this information helps. Thank you for shopping with us. FAQs about Sterling Silver from Overstock.com. Do you have questions about sterling silver jewelry? We've compiled the answers to the questions we get the most. Silver Types Fact Sheet from Overstock.com. Our guides provide customers with information about the types of silver. How to Buy a Silver Necklace from Overstock.com. Our guides provide customers with information about how to buy a silver necklace.